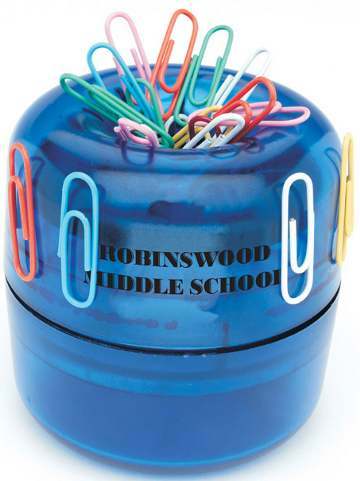 Custom Paper Clip Dispensers Personalized in Bulk or Blank. Promotional, Inexpensive. Each additional imprint color or position: add $0.50 per dispenser. SETUP CHARGE: $40.00 per color. Production Time: 7-10 days after art approval. Rush production is available: contact us; Blank paper clip dispensers ship next day. Puts your paperclips right at your hand and all in one place. A rainbow of colorful paperclips included: White Paper clip, Yellow Paperclip, Baby Blue Paperclip, Red Paperclip, Green Paperclip, Pink Paperclip, Orange Paperclip. Imprint size: 1.5" x .75"